Available at guaranteed low prices and Free Shipping, these bulk frisbees are great promotional items that can be used across company picnics, school events, club promotions, sport teams and league events, hospitals and other healthcare related fundraising gatherings, and much more. Flying discs are fun and interactive promo gifts that will bring life and energy to your special occasion, but also continue to endorse your message long after your event has ended. Our Frisbees can be custom printed with your business logo or motto, contact information, quotes or artwork of your choice. These are made with durable plastic, and are available in colors that include white, blue, yellow, orange, red, black, green, silver, pink, purple, teal and other shades that will accommodate to your liking. Get started today to receive in time for your function. Extremely happy with our order. The quality and price could not be beaten. My bosses were happy and we plan to use them again. 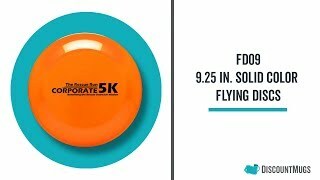 Frisbees serve our purpose well as a promotional item. Quick, easy, and delivered early! Quality product - delivered on-time. Nicely done!